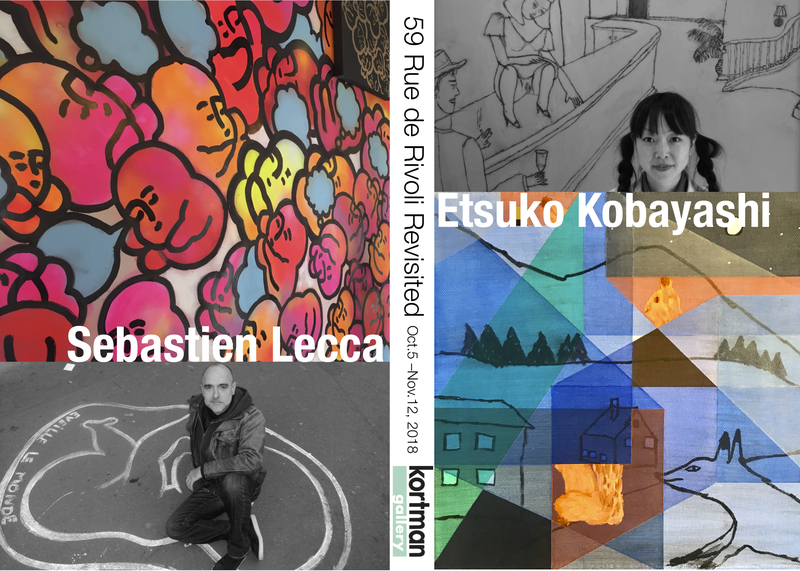 Parisian artists Etsuko Kobayashi and Sebastien Lecca have an entirely different approach to their art. Painter Kobayashi creates her expressive figurative works on canvas, while conceptual artist Lecca uses the urban landscape to convey his creative vision. But both artist have two things in common: They have had studios at 59 rue de Rivoli in Paris and will be exhibiting their art the Kortman Gallery in Rockford. The exhibition titled, “59 Rue de Rivoli Revisited” will open Friday, October 5th, ArtScene weekend upstairs in the Kortman Gallery. 59 rue de Rivoli is the address and name of an exciting contemporary arts space in the heart of central Paris that is home to studios of 30 artists. In 1999, the abandoned building was taken over by artists who, controversially, squatted all seven floors. And through their creative energy and persistence, turned the building into one of the most visited contemporary art venues in Paris! Etsuko Kobayashi, who has maintained a studio there since 2001, has become internationally known for her intriguingly quirky and unparalleled mixed media works. Her art was exhibited in the Kortman gallery 2004 in an exhibit called “Two Women of 59 Rue de Rivoli” along with Aurelie de la Cadiere. Sebastien Lecca, a multi-media conceptual and performance artist, in 2010, created the project, “Awaken the World” (first called "Super Fetus") based on the multidisciplinary repetition of the symbol of the fetus. With this project, through his ubiquitous street art, his imagery became a visual part of the Parisian urban landscape for years. He maintained a studio at “59” until 2017. “We are so excited to be able to bring the unique and fun works of these two intriguing artists adding an international flavor to the ArtScene and the Kortman Gallery,” says Doc Slafkosky, gallery director. “59 Rue de Rivoli Revisited” opening receptions are from 5:00 to 10pm on Friday, October 5th and 4 to 9pm on Saturday, October 6th. The exhibition will be on display through November 10th. The Kortman Gallery is located upstairs at J. R. Kortman Center for Design, 107 North Main Street in Downtown Rockford. For more information call 815-968-0123 or visit “59 Rivoli” Facebook page.